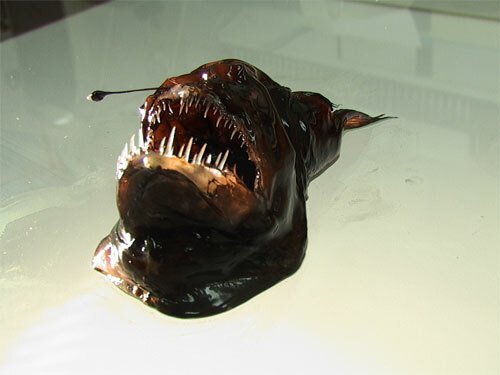 The female humpback anglerfish (Melanocetus johnsoni), shown here, is about the size of a tennis ball, with a large stomach and ferocious teeth like prison bars. Like many deep-sea fish it has watery flesh and light bones, and hangs in the water waiting for passing prey. The female also has a projecting lure with a light organ in the tip, and small eyes. The male is much smaller. Shaped like a jelly bean with fins, it has no lure, and a small mouth. In contrast to the female, it has muscles designed for swimming, and large eyes and nostrils. Whereas the female is equipped for efficient feeding, the male is designed for seeking out a female with which to breed. He follows the cues of her scent and lure, and once he finds her in the dark, he attaches himself with his hooked teeth and drinks her blood, and supplies sperm to fertilise her eggs. This deep sea creature is so mysterious and interesting because of their appearance and their capabilities. I just want to know more about anglerfish. expecting for more post about this creature.